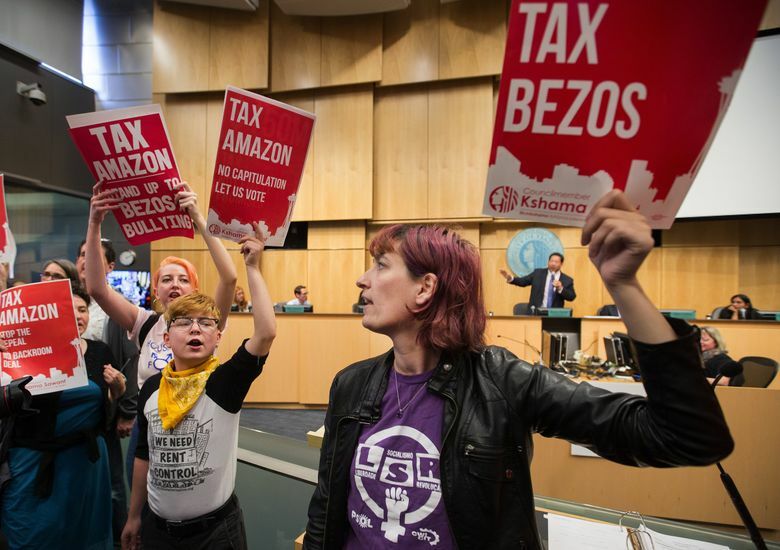 The repeal of the $275 per-employee tax marks a victory for Amazon and other businesses that would have paid it and have been funding a referendum campaign against it. 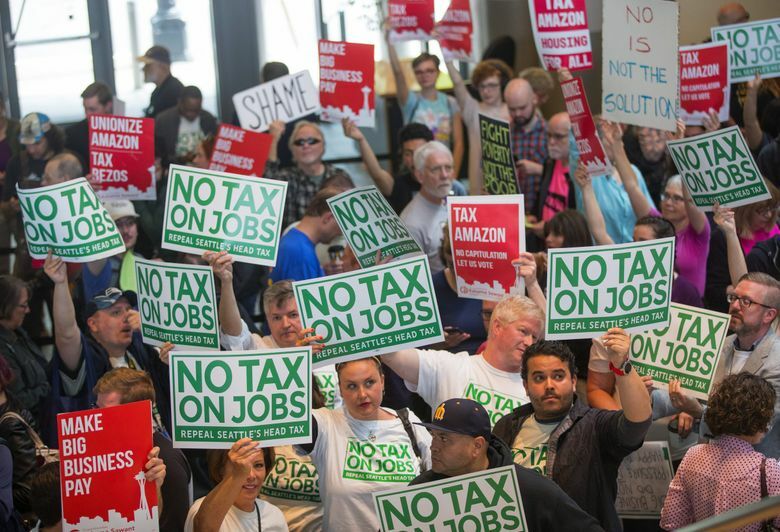 In a stunning reversal without parallel in Seattle’s recent political history, the City Council voted 7-2 Tuesday to repeal a controversial head tax on large employers like Amazon. 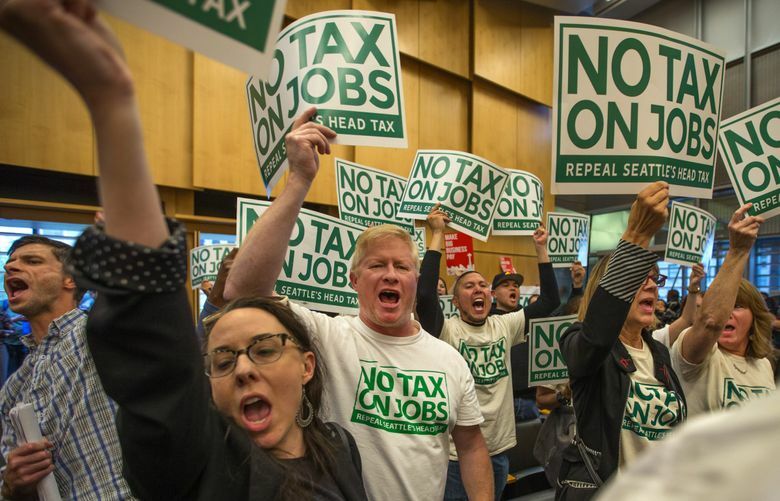 Before the tally, Councilmember Lisa Herbold said she felt like crying but would side with the majority of her colleagues because the Seattle Metropolitan Chamber of Commerce had managed to persuade “the vast majority” of voters to oppose the tax. Herbold said she lost hope over the weekend after seeing poll results and talking with advocates. Better to retreat now rather than see voters cancel the tax in November after a bitter, monthslong struggle, she said. “This is not a winnable battle at this time … The opposition has unlimited resources,” she said, drawing jeers from some in the crowd who wanted to fight on. Harrell and Herbold joined council members Mike O’Brien, Sally Bagshaw, Rob Johnson, M. Lorena González and Debora Juarez in voting for the repeal. 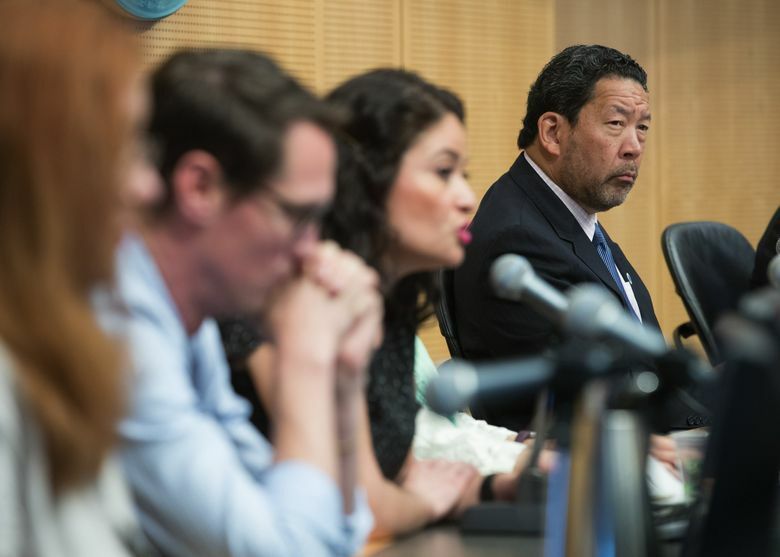 For Seattle leaders, the vote amounts to an embarrassing about-face. Only a few weeks ago, Durkan and council members were hailing the tax as an important step in the city’s response to a homelessness state of emergency declared in 2015. They didn’t count on how quickly business leaders would mount a big-money referendum campaign and apparently misjudged how many ordinary voters would support the effort out of frustration with City Hall’s handling of homelessness. Now the mayor and council members have no backup plan to raise the about $47 million per year the head tax would have collected from about 600 companies — those grossing at least $20 million a year. “Instead of engaging in a prolonged, expensive political fight, the city and I will continue to move forward on building real partnerships that align our strategies from businesses, advocates (and) philanthropy,” Durkan said in a statement. For Amazon and some other large companies that would have paid the tax and that have been funding the referendum push, Tuesday’s action represents a victory. Also pleased are residents with doubts about City Hall’s effectiveness, many of whom have volunteered for the referendum campaign. Though Seattle has greatly increased its spending on homelessness in recent years, the problem has only grown. 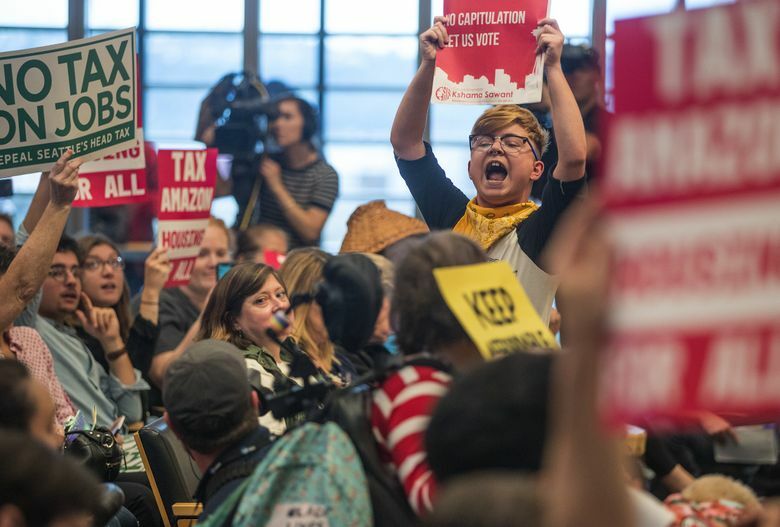 But the repeal is a blow for social-justice activists, homeless-services providers and homeless people who spent months lobbying for the tax, citing the severity of Seattle’s homeless crisis. Thousands of Seattle Public Schools students were homeless last year, and a record 169 people died on the streets of King County in 2017. Proponents of the tax say homelessness has grown because rents and home prices have soared. They say Amazon and other large companies can afford and need to do more to help because the city’s tech-industry boom has driven up those housing costs. Washington’s tax system has been rated the most regressive in the nation, and a Seattle income tax on wealthy households was recently ruled illegal in state court. 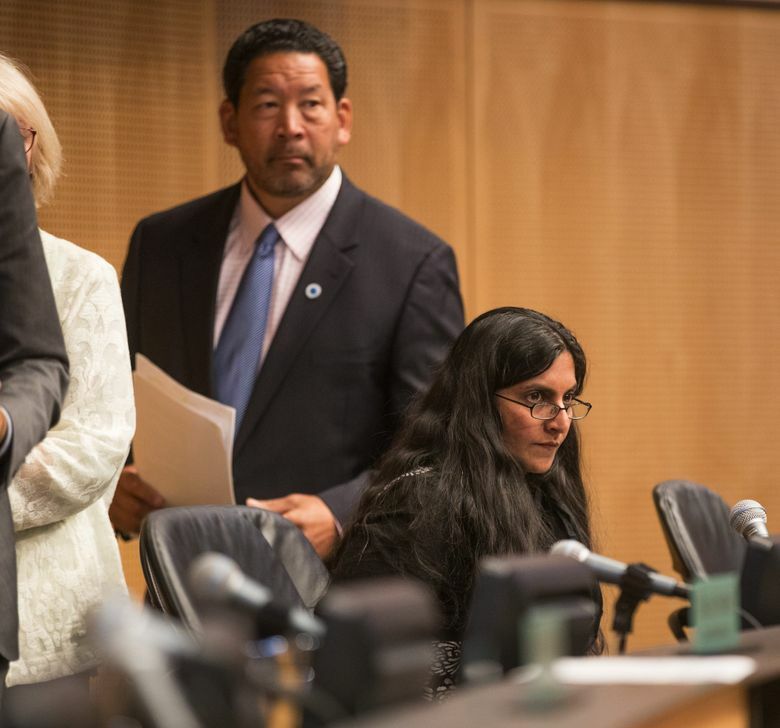 “I thought we had at least five courageous people on the City Council — and I was wrong,” she said at a rally with Councilmember Kshama Sawant before the meeting. 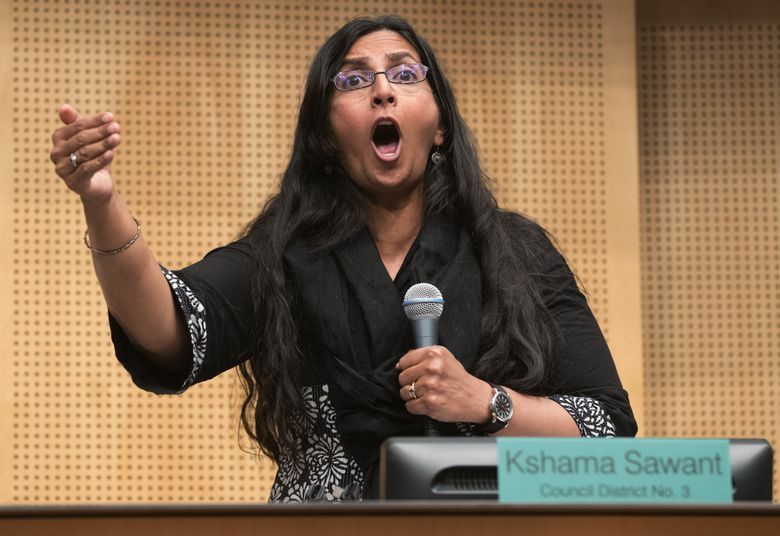 Sawant and Councilmember Teresa Mosqueda were alone in voting against the repeal, which Sawant called a “cowardly betrayal.” She condemned the action as bowing down to big businesses and as coming with “lightning speed” and “zero accountability” to working people. The city’s notice to the media about Tuesday’s special meeting came less than 24 hours in advance, violating a requirement under state law for such meetings. Mosqueda slammed the Chamber for boycotting stakeholder discussions earlier this year and accused Amazon of extending an “empty handshake.” The company pressured city leaders to scale back the council’s initial $500-per-head tax proposal, only to turn around and immediately pledge $25,000 to the referendum campaign. Adding drama to Tuesday’s proceedings, activists rang a gong 6,320 times — once for each person tallied as unsheltered in King County on a January night this year. The council’s seven district seats will be up for election next year, as constituents on both sides of the tax debate noted during an hour of public comment before the vote. 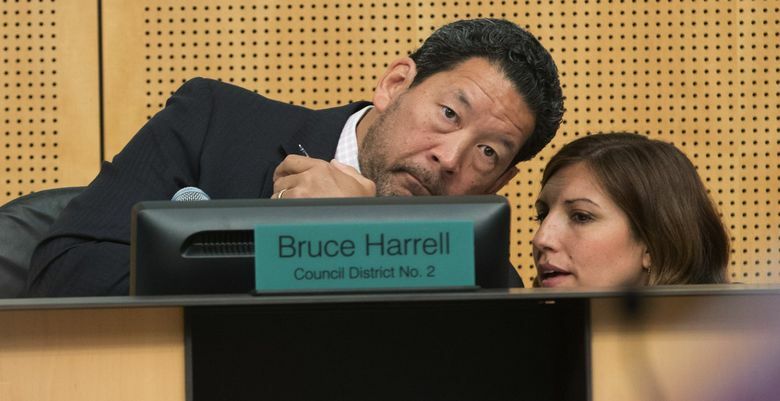 Though O’Brien described the head tax as the “best tool that we have” to combat homelessness, “I do not see a path” to win at the ballot, the council member said, basing his calculations on conversations with voters. “I can’t tell you how hard it is for me to say that publicly,” he told the crowd. Yet Sawant said the council should not have quit so easily. “We should have the confidence we can change the minds of other working people like ourselves,” she said. Uwajimaya supermarket’s Denise Moriguchi was among those urging the repeal, warning about grocery-price hikes and other unintended consequences. But the council’s abrupt U-turn struck even some critics of the head tax as puzzling and left people on both sides wondering about whether to trust their officials. Editor’s note: While The Seattle Times Company would have been affected by the head tax, and the editorial board has commented on it, The Times’ news coverage is separate from those functions and remains independent.